The second commission was for a wine merchant, Rookwood & Perry, in the Hudson River Valley. I am not sure why they felt an owl was needed for their image, but I sure enjoyed drawing it! I have been receiving links to this all day, re: the hidden message of "MOM" in Wendy's collar. Ha! My mom actually detected this way back when it was unveiled, and I did not disabuse her of the notion. But no, it was not intended. My work is so calligraphic, I expect it is full of unintended messages like this one. Here is a beautifully written ode to Pope hope, on the advent of the Papal succession, by writer Rebecca Brown. 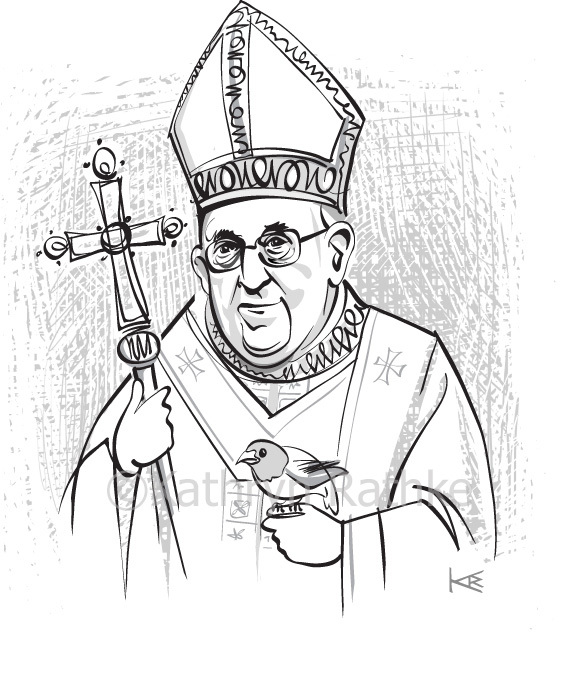 It gave me another opportunity to add to my Pope Collector card series. Thanks, Stranger Magazine! "The Cat and the Mouse Set Up House"
. I had the good fortune to be found by Tesser and together we went through scads of revisions to arrive at the final a really good looking final. Here is my final version. She received a few final tweaks from the artists at Tesser, noticeable mostly in the hair. I am delighted. The Stranger Magazine, Seattle's alternate weekly, runs a "Regrets" issue at the end of every issue, in which they list all of the errors, regrets, etc., of the paper's staff and contributors. This year they solicited regrets from area artists & writers. I wrote in that I regretted that I have drawn many authors, but had never yet had the opportunity to draw Kurt Vonnegut. The paper responded by asking if I would like to draw him as the feature illustration for that segment of the paper, thereby allowing at least one citizen the opportunity to conquer one of her regrets! I was so delighted to get the assignment to do Joan Didion for Intelligent Life Magazine. Her apparent frailty in appearance totally belies her continued ferocity. I find her the epitomy of cool. The new James Patterson book, Worst Case is finally out, and full of my illustrations! I was asked to conjure up the lead character's 10 adopted children. It was a hoot: I was given only ages and ethnicities, with maybe two words of description for each. Despite the meager descriptions, I tried to instill them with a lot of character. I can't even fathom the idea of millions of fans contemplating these characters, whom they have tried to imagine all of these years; it's a huge responsibility! Here's a fun one! Intelligent Life Magazine asked for Dylan portrait for his 70th birthday. Martin (Lovelock) said I could choose the era of my choosing, as long as it evoked essential "Bobness". This is a melding of two ages: the face of Dylan now, the iconic hair of earlier day, the stern aspect which is, apparently, timeless. It was hard to find any photos of this man expressing mirth! Glad Carl Paladino isn't running here! It is time again for The Stranger Magazine's annual Genius Awards! For this year's portraits I experimented with doing entire bodies instead of just faces, all because I wanted to do a full figure of a horse for the film recipients. Susie Lee is shown with one of her characteristic performance shadows, and Jim Woodring holds one of his surreal creations. Madness! NY Observer needed a rush job for its cover - George Steinbrenner had just died, and they needed to send the paper out at 5pm (2pm my time). Phone rang at 7am. Could I do it? Coffee and reference in by 8, final art delivered 1:24 PDT. Whew! 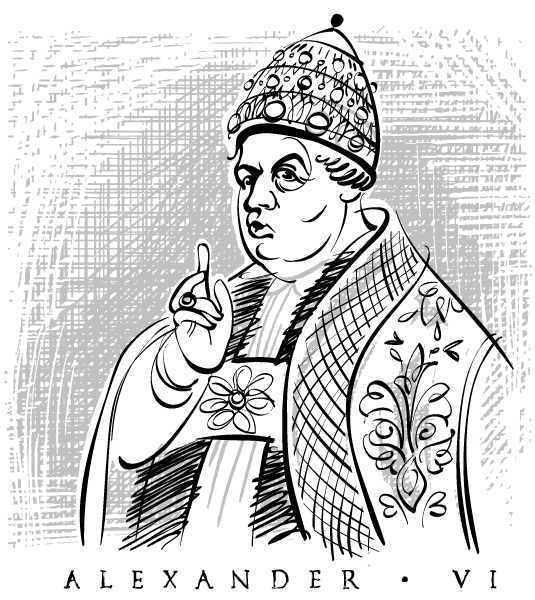 This week's Stranger Magazine has a feature on the worst popes through history, by hilarious and talented writer Lindy West. I got to pick three of the most photogenic popes (from a surprisingly long list that began in 157 a.d.) for portraits. I just sent out a new email campaign, featuring Beards in all of their tonsorial glory. Woefully, I blundered in one credit. This fellow, Chef Pietoso, was a commission from Cincinnati Magazine, not Cleveland Magazine. Sheesh, you'd never know I was from the midwest. My apologies, Grace! I am so delighted and honored to have just secured a place on this great blog, Partfaliaz. The administrator, Antoine, is clearly very selective, choosing only artist whose work inspires him. Funny that this is a French site, and he chose to feature an illustration that is indeed supposed to represent a french woman, drawn for a wine label proposal. What a great group in which to be to be included!